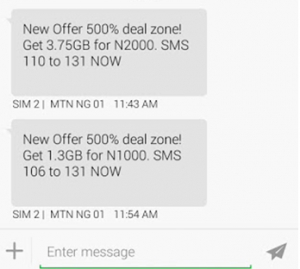 MTN 3.5gb for 2000 & 1.5gb for 1000 – New! I decided to do a test on the MTN latest data plan. Loaded N2000 airtime on my MTN line and dial the subscription code for 3.75GB data plan, I discovered that the actual data plan for N2000 is 3.5GB and not 3.75GB while that of the N1000 is 1.5GB and not 1.3GB. MTN Nigeria, the leading Nigerian telecommunication has release two latest cheapest data plans. These two new data plans are 3.75GB 3.5GB and 1.3GB 1.5 data plan. It came as a surprise on text sms message! However, this is time I can say for sure; you need it. How much is MTN 3.37GB 3.5GB DATA Plan and 1.3GGB 1.5GB DATA Plan? You can get 1.3GB 1.5GB at N1, 000 and 3.75GB 3.5GB at N2, 000. This is one of the cheapest data plans so far. To subscribe for the 3.75GB 3.5GB plan, recharge your phone with N2,000 then send 110 to 131 or simply dial *110# activate 3.75GB 3.5GB data plan. How long does these new MTN data plans last? The new plans are also more convenient than buying data plans from re-sellers. What do you think? Cool, right? Ok, If you don’t like these new data plans; do you want to go back MTN betterme bundle which offers 2015mb for N2015? I’m sure you don’t! Enjoy! Share this if you love! For your questions and comments you can use the comment box below this post.